Deep space is not as silent as we have been led to believe. Every few minutes a pair of black holes smash into each other. These cataclysms release ripples in the fabric of spacetime known as gravitational waves. Now Monash University scientists have developed a way to listen in on these events. 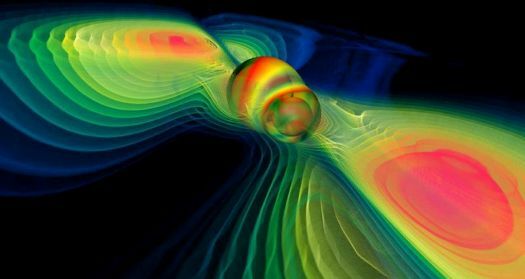 The gravitational waves from black hole mergers imprint a distinctive whooping sound in the data collected by gravitational-wave detectors. The new technique is expected to reveal the presence of thousands of previously hidden black holes by teasing out their faint whoops from a sea of static. Last year, in one of the biggest astronomical discoveries of the 21st century, LIGO Scientific Collaboration (LSC) and Virgo Collaboration researchers measured gravitational waves from a pair of merging neutron stars. Drs Eric Thrane and Rory Smith, from the ARC Centre of Excellence for Gravitational Wave Discovery (OzGrav) and Monash University, were part of the team involved in last year’s discovery and were also part of the team involved in the detection of first gravitational-wave discovery in 2015, when ripples in the fabric of space time generated by the collision of two black holes in the distant Universe were first witnessed, confirming Albert Einstein’s 1915 general theory of relativity. To date, there have been six confirmed, or gold plated, gravitational-wave events announced by the LIGO and Virgo Collaborations. However there are, according to Dr Thrane, more than 100,000 gravitational wave events every year too faint for LIGO and Virgo to unambiguously detect. The gravitational waves from these mergers combine to create a gravitational-wave background. While the individual events that contribute to it cannot be resolved individually, researchers have sought for years to detect this quiet gravitational-wave hum. In a landmark paper in the journal, Physical Review X, the two researchers have developed a new, more sensitive way of searching for the gravitational-wave background. “Measuring the gravitational-wave background will allow us to study populations of black holes at vast distances. Someday, the technique may enable us to see gravitational waves from the Big Bang, hidden behind gravitational waves from black holes and neutron stars,” Dr Thrane said. The researchers developed computer simulations of faint black hole signals, collecting masses of data until they were convinced that — within the simulated data — was faint, but unambiguous evidence of black hole mergers. Dr Smith is optimistic that the method will yield a detection when applied to real data. According to Dr Smith, recent improvements in data analysis will enable the detection of “what people had spent decades looking for.” The new method is estimated to be one thousand times more sensitive, which should bring the long-sought goal within reach. Importantly the researchers will have access to a new $4 million supercomputer, launched last month (March) at the Swinburne University of Technology. The computer, called OzSTAR, will be used by scientists to look for gravitational waves in LIGO data. According to OzGRav Director, Professor Matthew Bailes, the supercomputer will allow OzGrav’s researchers to attempt these kind of landmark discoveries. The OzStar computer differs from most of the more than 13,000 computers used by the LIGO community, according to Dr Smith, including those at CalTech and MIT. OzStar employs graphical processor units (GPUs), rather than more traditional central processing units (CPUs). For some applications, GPUs are hundreds of times faster. “By harnessing the power of GPUs, OzStar has the potential to make big discoveries in gravitational-wave astronomy,” Dr Smith said.